So you still want to play the odd CD, but you also want computer connectivity? Kramer assesses Yamaha’s latest combo player. WHAT THE HECK is a Network CD Player? That was the first thought when I was offered Yamaha’s CD-N500 to review. I get the idea of network music players and of course, the CD player is a familiar enough device after all these decades, but this machine theoretically combines the best of both worlds by adding computer and internet connectivity to a standard CD player. Where many other CD player manufacturers have included built-in USB Digital to Analogue converters to allow for computer playback, Yamaha has instead chosen to bundle in Ethernet connectivity to allow the CD-N500 to reach out to the connected world. 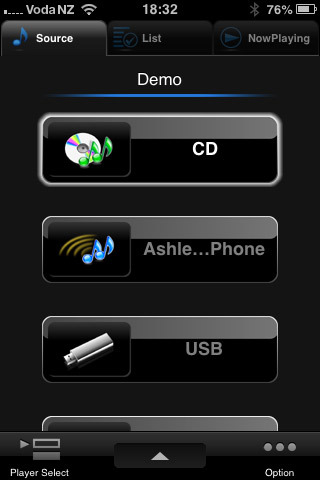 You might wonder how it’s possible to control all that functionality from the single line LCD display and sparse front panel controls even with the remote control, but the CD-N500 is designed to be run from Yamaha’s Network Player Controller App (available in iOS and Android flavours). There is a strange eccentricity to this player’s digital functionality. Network audio support out of the box is limited to Windows computers running Windows Media Player and NAS drives, which leaves Mac users out in the cold until extra software is installed. This seemed to be quite odd, so rather than messing with my production Mac, I stuck with PC connectivity throughout the test. The CD-N500 is constructed pretty much as expected from a CD player at this price point – a clamshell cover is wrapped around the chassis with a metal faceplate up front. Like most of Yamaha’s recent stereo components, it’s a decent-looking thing, replete with the familiar (and rather stylish) rectangular and square buttons. However, the exposed round screw heads on top and on the sides of the metalwork are a jarring visual element. Round back, there are the standard RCA analogue outputs, optical and coaxial digital outputs and the aforementioned Ethernet port – no Wi-Fi access to the player is provided, but that’s not a terrible thing given the inherent reliability of a wired connection. However, this can be awkward if your router is a long way from your hi-fi system, in which case, you’ll either have to run a long length of cable or relocate bits and pieces as needed. For those who prefer Wi-Fi over wired, an optional wireless bridge is available, but a wired-only network device seems very 2009 somehow. The DAC is a 192KHz/32-bit Burr-Brown unit, feeding symmetrical audio circuitry with independent power supplies for the computer and CD parts of the circuit. The chassis has a double structure with steel dampers designed to reduce vibration. The transport mechanism is further vibration proofed, and the optics are optimised for CD playback, so it seems that the Yamaha engineers have put some time and effort into making this a high-quality CD player first and foremost. Obviously CD, USB and Apple device playback are effortless but the CD-N500 also proved dead easy to set up as a network player. Moments after plugging in an Ethernet cable from a router, I had internet radio stations running from the built-in list using the front panel display. This isn’t the optimum interface, so the iOS App was fired up and that was equally easy to use. The app isn’t the most modern looking piece of software. It looks like it was designed by a Japanese engineering team, not a funky, young and hip design group based in Cupertino, but it’s totally practical and does offer access to most of the player’s functionality as described. A fair few Yamaha CD players have crossed my path in the last five years or so, from the then range topping CD-S2000 at $2999 (when new) to the more humble models at under $500. All have impressed at their respective price points and the CD-N500 is no different. Even if it was nothing more than a plain old CD player, this unit strikes me as being able to compete sonically with many equivalently priced models. The fact that it does so much else is a nice cherry on top. 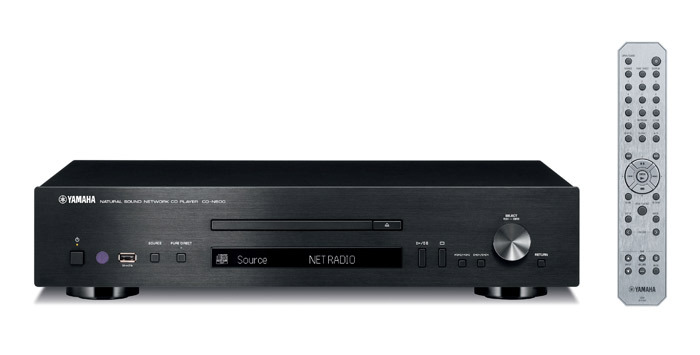 The CD-N500 carries much of what I consider to be the signature sound of Yamaha’s recent CD players – big, reasonably lean and a tad dry but still easy to listen to. When spinning silver discs, the CD-N500 wasn’t just good to listen to, it was a real pleasure, sounding self-assured with a particular strength in the top end for a $1000 player. Cymbal strikes and guitar harmonies were clearly delineated, but sibilant female vocals were never allowed to get annoying despite the lack of overall warmth to the presentation. Instrumental separation was another strength, with the CD-N500 having an easy ability to manage both timing and placement. As good as the CD-N500 is as a CD player, that front mounted USB spent a fair amount of time with an 80Gb iPod Classic plugged into it because with CD quality files, this input at least matches the CD transport, and in some cases, it sounded better – just a touch more insightful, with slightly better dynamics. The quality of internet radio playback varied immensely as it always does depending on the quality of the inbound stream, but with decent quality stations, the CD-N500 was one of the best internet radio sources I’ve had at home. As a streamer, the CD-N500 works like a charm. You definitely want to drive it from the app, but that’s not a limitation. Once connected, you can run the player’s network functionality pretty much any way you choose, and you can play files stored on the actual smartphone, without needing access to a computer drive. Files stored on my Acer Netbook were streamed to the CD-N500 with little effort and sonically, they were impressive, especially once I started moving some high-resolution files across the Ethernet link. The expected sense of extra detail, separation and air around the performers from high-res files was obvious (if not overwhelming), so the CD-N500’s credibility as a high-res streamer are solid. Despite my earlier mutterings about the lack of a built-in Wireless option, the CD-N500’s wired connection proved its mettle by being utterly reliable over the lengthy duration of the test, with zero dropouts and no stuttering even on high resolution streams. In some ways, this unit is based on thinking from a few years ago but for much of its target market, it’s not an issue. Yes, it’d be nice to have a big colour screen on the front of the unit but the price point and the physical limitations of the form factor put paid to that, and in any event the app more than does the job as a control interface (with the remote control being a useful backup). The lack of Bluetooth support is a bit of a pain in this age of streaming services – playing files from the phone is nice, as is having direct access to internet radio from the app, but my love of Pandora left me feeling as if something was missing in the CD-N500’s arsenal – adding in Bluetooth would make this an even more capable device. Great net cd player, ways better than the CD-S700 i had before.